We have our jackpot winner! 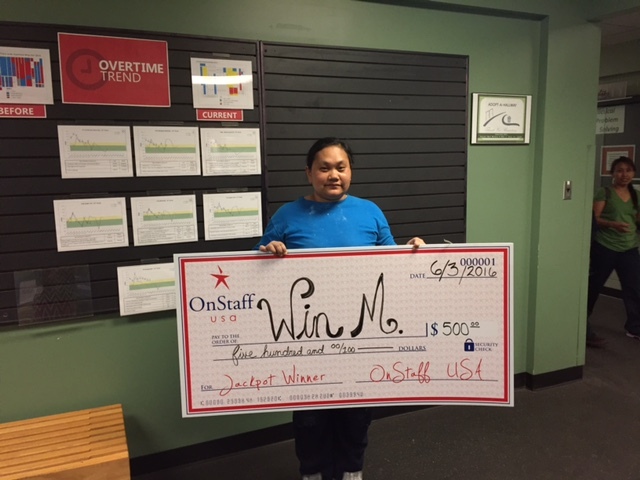 Win is one of our great employees out at Denso working through OnStaff USA. We were very happy to present her a check for $500 this month. You could be our next winner. All it takes is a good work ethic and to be working for OnStaff USA at one of our many clients. We have immediate openings so apply today. We have an April winner!!! Eliason has one of OnStaff’s best employees. 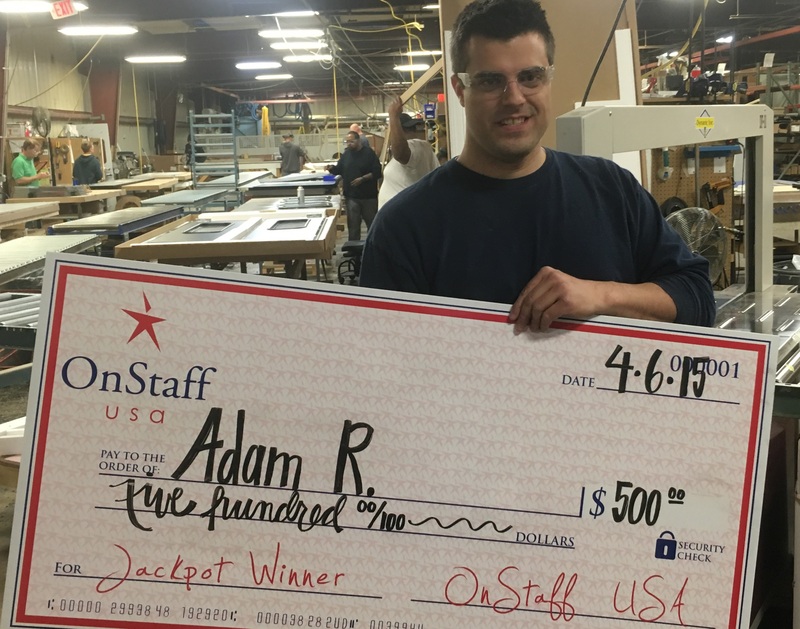 Adam was able to win our April Jackpot of $500!!. We are giving away $500 each month this year. Apply today and get your chance to win. Andre is really excited to be taking home an extra $500 this month. He is our latest winner of our monthly jackpot. 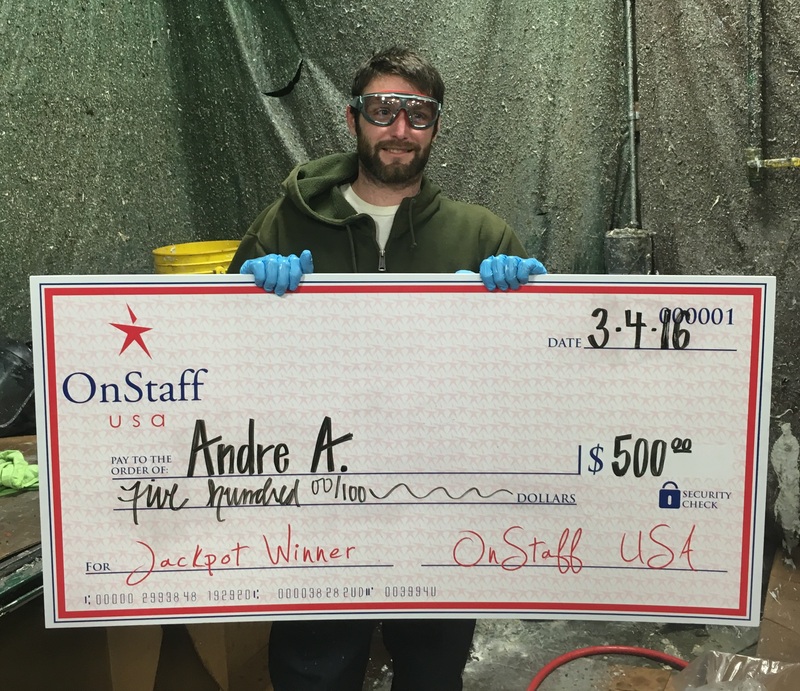 Andre has been a great employee for OnStaff USA out at ChemLink. There are many openings available. Apply today and you could be our next monthly winner of $500! Work for your chance to win! 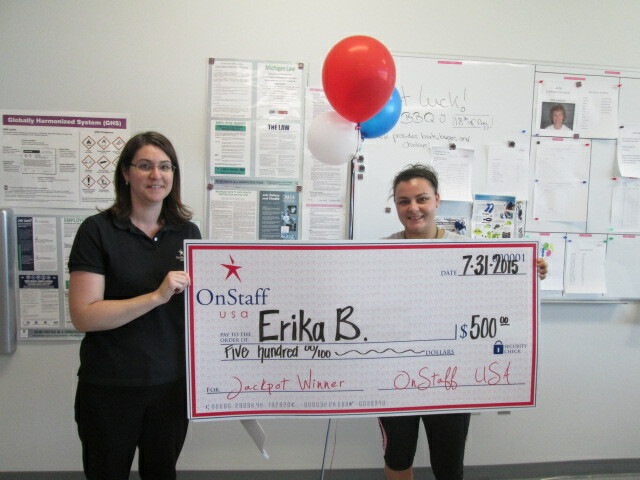 You could be the next winner of OnStaff USA’s monthly $500 Jackpot! There are a lot of great openings available for us to place you in. Do not forget to refer a friend and get a bonus from that as well. Apply online today! Tim gets $200 extra this week! 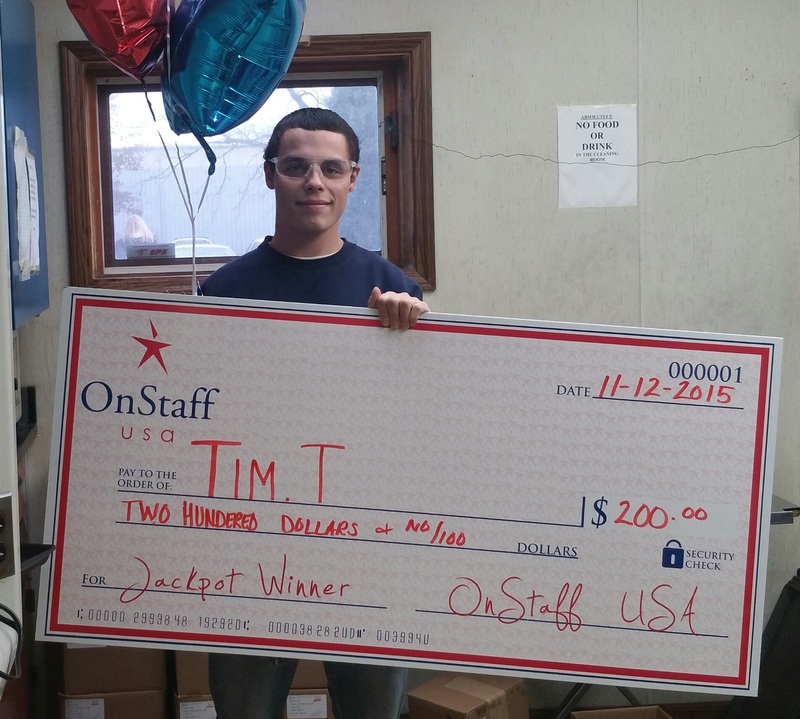 Tim has been named as this weeks winner of OnStaff USA’s progressive jackpot. Apply today and your name could be drawn next week for an even bigger check. Cody M. took home a little extra this week! “Wow! When you told me I would be entered into the drawing, I honestly did not think I would win. 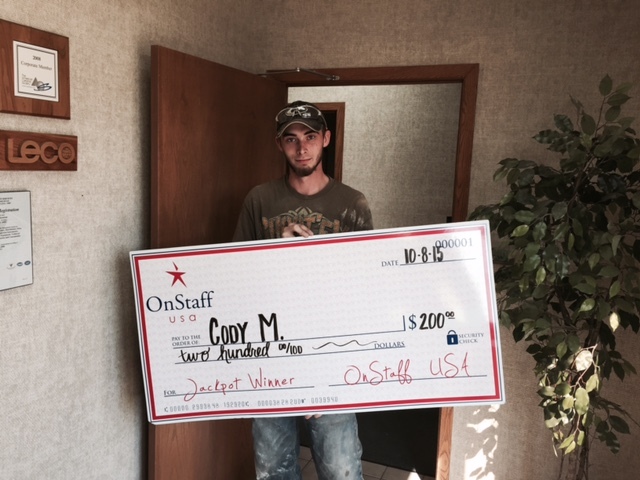 Thank you though, I appreciate it.” Cody was really happy to be this week’s winner of the jackpot. He is a great employee for LECO through OnStaff USA. Cody was able to start his new career this year and you can to. Apply today for one of the many job openings that we have available. Would you like to take an extra $300 in your paycheck? Eric was able to this week. He is one of OnStaff USA’s latest winner of our weekly Progressive Jackpot. 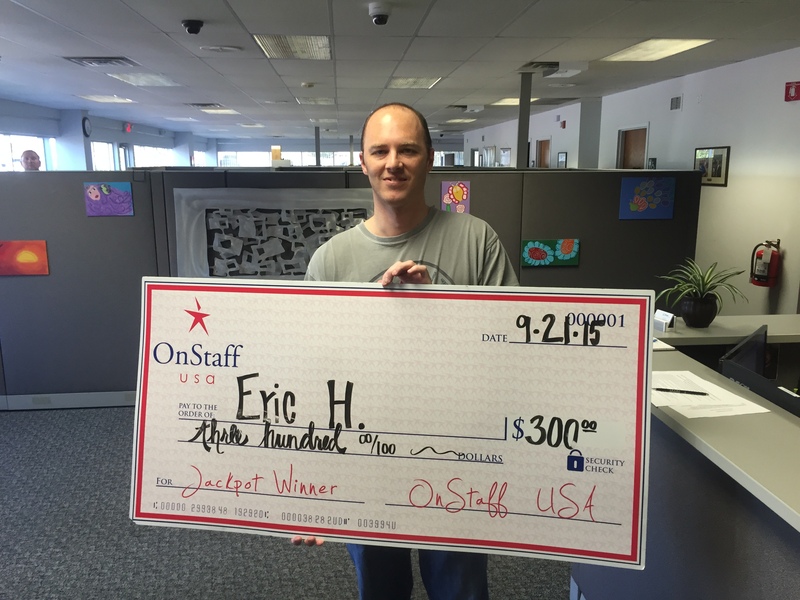 Eric has been a great employee for OnStaff out at Schupan and Son’s. Eric is very happy to have a wonderful new career at one of Kalamazoo’s best companies to work for. If you would like your chance to win apply today. 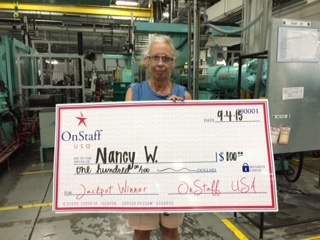 Nancy is really happy to have a great new career with OnStaff USA. 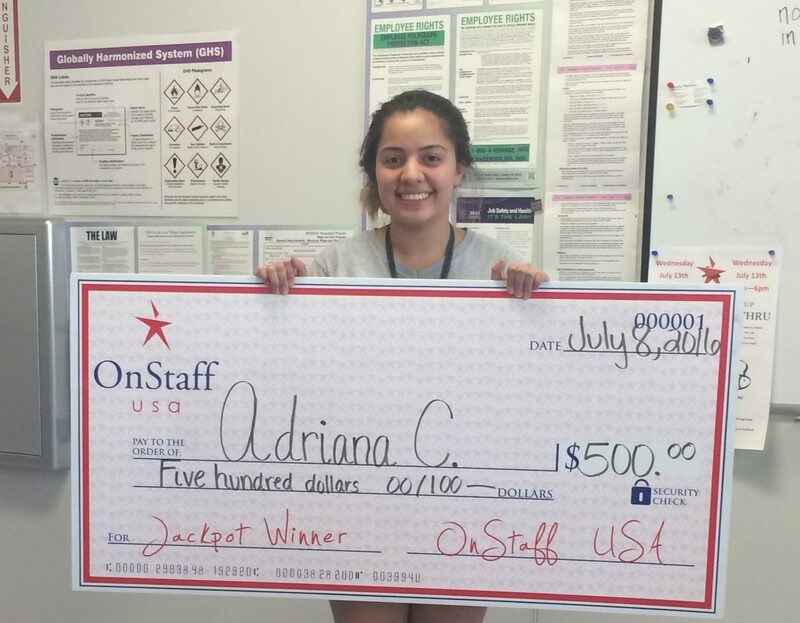 She is more excited to be the latest winner of OnStaff’s Progressive Jackpot. You could be the next winner. 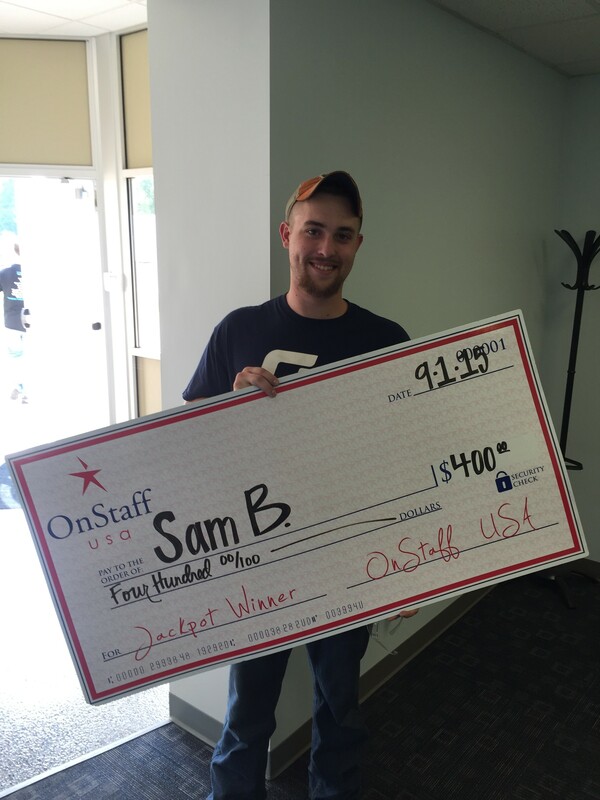 One employee is picked each week and awarded up to $500. For your chance to win apply today and work for one of the many great companies that OnStaff partners with. © 2019 OnStaff Group. All Rights Reserved.